Our ceramic studio is in the little village of Cambridge in upstate New York. Shown to the left is the main room where the glazing and firing of our cat fountains and indoor fountains is done. To the rear is the throwing area with 2 throwing wheels. The 50 year old Shimpo on the right, below, is used mostly for trimming. The newer Pacifica is used mostly for throwing our fountain bowls and the bases of the pump-hides. Just visible to the back right of the image is the glaze area where we store all the raw materials we use for making glazes. We make all of our own except for one we purchase ready made. In the photo to the left Joyce and Jackie are doing hand-building. The images below are of their work. Both brings years of jewelry making and other well honed skills and talent. This is one of our most popular designs. The base of the pump-hide is wheel-thrown, the Lotus blossom is handmade. In the fountain below, left, the fish is entirely hand formed. The trick here is to make it so the water flows smoothly from the fish’s mouth. In fact it flows beautifully, thanks to Joyce’s expert touch. 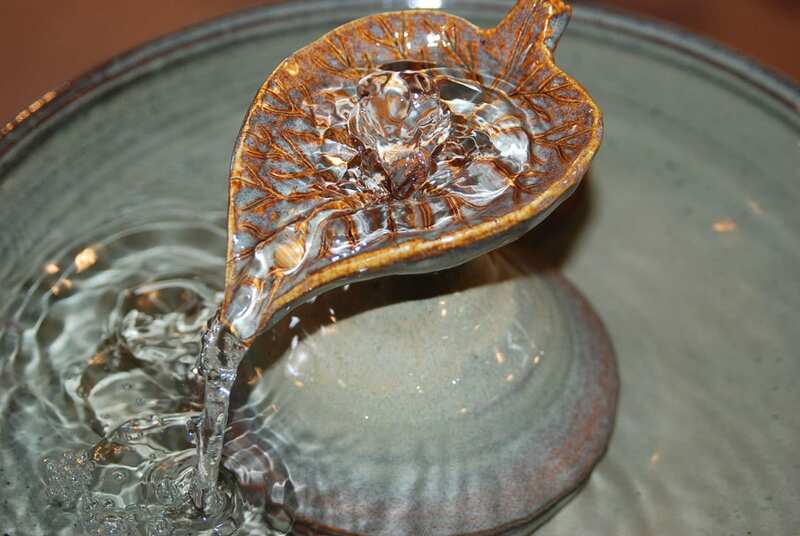 The leaf fountains are extremely popular with cat people, both because they look so nice and because they are very effective cat fountains as well as decorative home decor fountains. A knowledge and intimate familiarity with plants help make these cat fountains truly authentic. Note that the flow is adjustable in all of our fountains and though the cord exits the base, they are all replaceable too. Another member of our team is Chikae who assembles fountains, works with copper, mixes glazes and does a variety of other tasks. Here she is applying wax resist to pots and pump-hides before we do a glazing. Behind her, to the left is the jeweler’s bench with a flex-shaft tool, an oxy-acetylene torch and a variety of hand tools, all of which see a lot of use.